These three make one sweet trio! You can make all three patterns – the raspberry, blueberry, and strawberry – with this one ebook. Each berry is the perfect size to fit in your hand. When using worsted weight yarn, the blueberry measures about 3.5 inches tall, and the raspberry and strawberry are each about 4 inches. While these three have simple shapes and no limbs, their patterns aren’t boring or basic. Both the raspberry and strawberry have fun stitch patterns to give them great texture, and the blueberry has some colour changes and cute little triangles on top. What I love most? The stem of the raspberry can pop out to reveal a little hollow “cup” inside the body – just like a real raspberry! These amigurumi patterns include detailed instructions and step-by-step photos, plus you can contact me along the way to ask any questions. 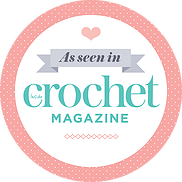 They are all intermediate level patterns that involve starting with a magic ring, chain stitch, slip stitch, single crochet, half double crochet, double crochet, triple crochet, increasing, decreasing, attaching pieces, changing colours, and working through both loops and back loop only.